Want to change a complex system? The global fishing industry is exactly that. A look at how Greenpeace and partners took on Thai Union by reaching pet lovers and exposing human slavery. The global fishing industry is a classic complex system. The supply chain includes everyone from international corporations to individual fishermen at sea for months or years. Changing how fishing works is one of the most challenging campaigns out there. Here’s what we can learn from the recent work to reform Thai Union. 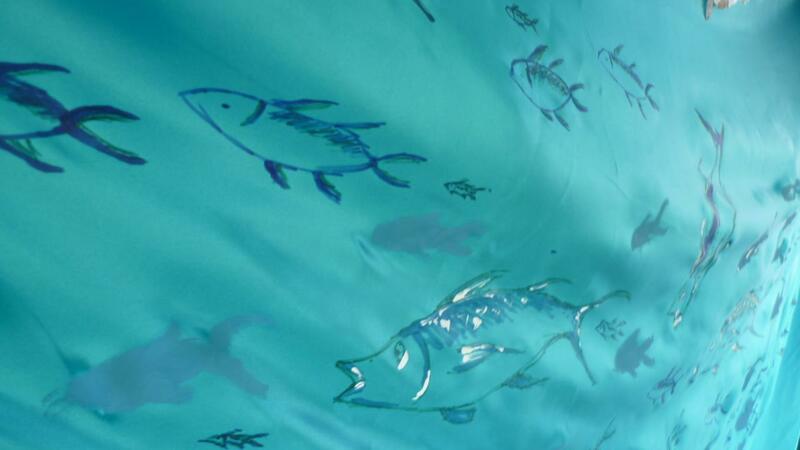 Global fishing sustainability has been in a precarious position for decades. Commercial fishing is a complex worldwide industry with hard to trace supply chains and nearly invisible players far out to sea. Despite devastating ecosystems worldwide, it’s long been a challenge for Greenpeace and other conservation advocates to expose and shift how the system works. Thai Union is one of the largest seafood companies in the world. Its supply chain connects global fishing markets, ports, and customers. But Thai Union has a tiny public profile and is virtually unheard of amongst global consumers. In 2014, Greenpeace organisers chose to put a broader, more human lens on their fisheries campaign. They partnered with human rights and labor organizations. Moving companies like Thai Union needed a coalition of voices (and skills) with a unified message. The shift, and partners, played a key role in what was ultimately a successful campaign to get Thai Union to publicly adopt sustainability and labor standards. 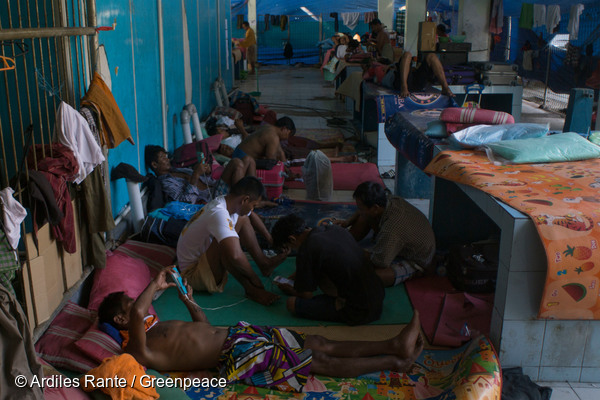 Burmese fishermen in temporary shelter in Ambon port, Indonesia. 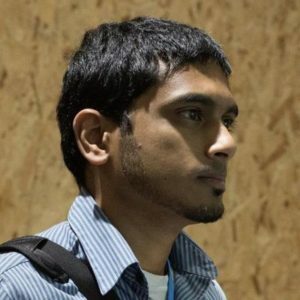 Forced labour and trafficking survivors interviewed by Greenpeace Southeast Asia detailed beatings and food deprivation for anyone who tried to escape. The tuna fishermen on their vessels were forced to work 20-22 hour days for little to no pay, often deprived of basic necessities like showers. Photo by Ardiles Rante, Greenpeace. Greenpeace had been a member of the Thai Seafood Working Group since 2013. 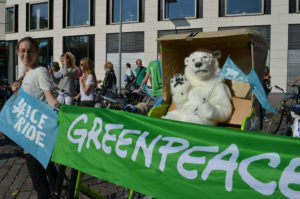 Greenpeace presented its campaign to the Working Group, a coalition of about 60 different human rights and labor organizations started by the International Labor Relations Forum (ILRF), before going public with it. Greenpeace, labor unions and others soon learned that they all had been working on various fisheries labor, human rights, and environmental issues. Each had information valuable to new partners. For example, Greenpeace had long been using its ships to document illegal fishing. Crews often found evidence of labor abuses. Partners also learned that similar economic and supply chain issues were driving both overfishing and labor exploitation. Billboard along Pacific Coast Highway in San Diego, California. 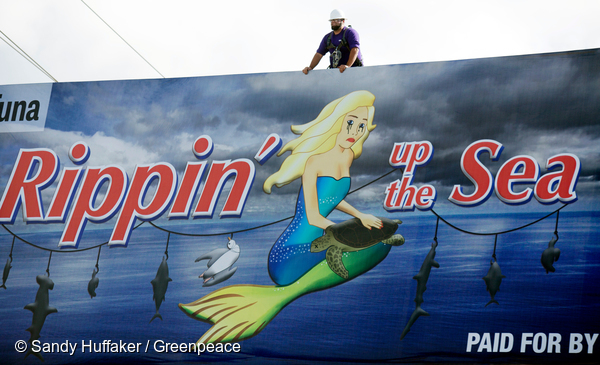 More than 1,250 people pitched in to fund three “Rippin’ up the Sea” billboards in San Diego, one directly across from the company headquarters. Photo by Sandy Huffaker, Greenpeace. Of course, just having a stronger message was not enough. Thai Union had little name recognition among global consumers. This meant Greenpeace would need to get creative with targets and how it engaged the public and decision makers. In the U.S., campaigners focused on Thai Union’s better-known subsidiary, Chicken of the Sea. Campaigners also found new voices on digital platforms. Pet food makers are big Thai Union customers. Greenpeace enlisted the support of YouTube pet celebrities to make the campaign relevant in places like New Zealand, where there are no Thai Union brands. Celebrities engaged their followers to pressure Mars Petcare and Nestle Purina to stand up against overfishing and labor exploitation in their supply chains. “That reached a new audience, and led to commitments from both Nestle and Mars to address problematic transhipment [offloading product to other boats–allowing a fishing boat to continue fishing, sometimes for months or years at a time] in their supply chains,” said Pinsky. Earlier this year, Thai Union agreed to a code of conduct for vessels in its supply chain. The next step includes monitoring to ensure the agreement is adhered to and that it has a positive impact both for oceans and workers across Thai Union’s supply chain. The campaign demonstrates the power of broad coalitions that connect historically disparate issues (the environmental and labor practices of fishing companies) with a common cause. For Greenpeace, it’s also clear that the decision to look at fisheries from a different perspective earlier this decade was the right one.